I am no nature nut. But, I am OK with that, because my losing streak makes the kids laugh and they want to play again. And again. And again. According to the website, this game is for two to four players, ages 8 and up, but it was fairly easy to modify to allow my 5-year-old to play. We set his point value low (20 points) and (depending on the question) we made up multiple choice answers for him. With these two adjustments, he was very competitive (heck, I'd be more competitive with multiple choice!). The animal category questions were definitely some of the easier questions for us. What is the name of a female lion? What is the difference between the feet of frogs and toads? Not that we knew all the answers! The Earth question topics were a real hodge podge -- magnetism, the moon, environmental science, geology, basic chemistry. We really didn't know what we'd get in that subject, which made this my favorite type of card to get. Questions about plants were from ecology/ environmetal science and plant biology topics. Some of the 7-point questions were T.O.U.G.H. for us. It's been a few years since my 12-year-old (rising 7th grader) has studied plant biology, so he was definitely befuddled by many of the 7-point questions. For my 8-year-old 3rd grader, however, the types of 3-point questions were fairly spot-on for his knowledge base -- not that he could answer all them. I think a good percentage of the 7-point question could be more easily answered by both my 8-year-old and 12-year-old if we had just finished a science course on plants and/or animals or had an on-going interest in biology. As much as Ben likes science, he's more of a physics kid, so these questions challenged him, which is a good thing. It isn't often that he gets stumped! and this picture was snapped after pulling the Wise Alec card that said, "Your horse passed gas. Minus 3 points:"
Laughing and trivia at the same time -- the creators of this game deserve a high-five for that card. Another high-five for Griddley Games: the directions are imprinted on the cover of the case. That's one less game in Toy Heaven because of a lost set of directions. As a matter of fact, Griddley Games was founded by a mom (who must've had her own collection of direction-less games). Their products have won TONS of game and toy awards, so even if Nature Nuts doesn't sound exciting to you, it's worth a browse through their website to see what else they offer. 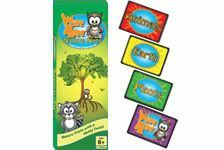 I forgot to mention earlier that Nature Nuts can be an add-on expansion kit to Wise Alec, a full-blown trivia game for the family. At the time I am writing this, Griddley Games does not have a storefront of their own. However, the games are readily available at retailers and online. It is retailing for $14.99 on Amazon right now. I hope we can use this game more in the future to supplement our science learning in a fun, crazy way. If you'd like to read more about Nature Nuts and Civilize This! by Griddley Games, click on over to The Old Schoolhouse Review Crew to read more! Thanks to Griddley Games who provided a free game for my family to use in exchange for our honest opinion about it! We would love a postcard from NH!! It is one of the 8 states we're missing! :) Could you email me (heidi at poetsgarden dot com) for my address? I looked for your email address and didn't see it. Thank you!